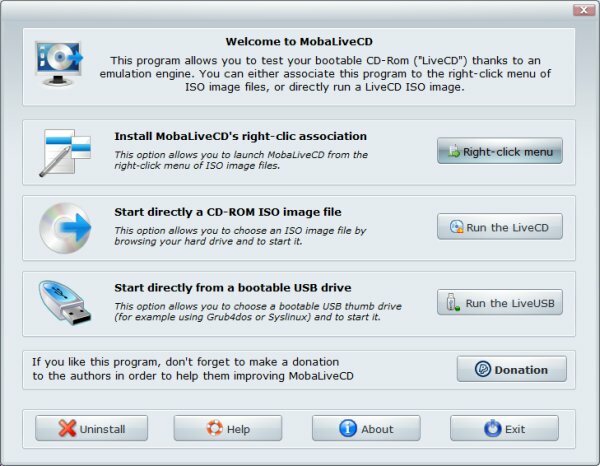 Recently, I discovered that many Linux websites recommend using Mobatek MobaLiveCD utility as the simplest way to test their distributions, in case you do not want or cannot afford to boot from live CD. This got me intrigued. Exploring a bit more, I discovered this tool is in fact a smart frontend for QEMU, capable of loading ISO images, without any modification to the underlying system. In a nutshell, a virtualization, or rather, an emulation product, if you like. On paper, MobaLiveCD looks like a neat idea. It hides away the command line interface and spares the user from being a geek. Furthermore, there's the whole no-installation thingie. Rather than having a complete virtualization suite on your machine, you use a lightweight solution that does not alter your system. Moreover, there's the laziness effect, too. No need to burn a disc image or reboot your machine. 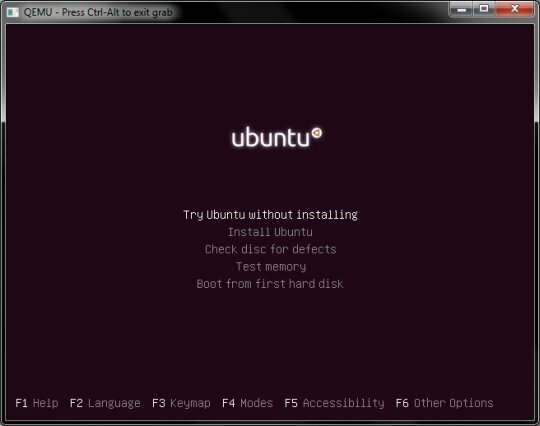 Just load the ISO, examine the distro, and if you're satisfied, go for the full installation later on. Sounds very good. So I tested it. Download the executable and run it. As simple as that. So far, as promised, MobaLiveCD does not require a formal installation. Reminds me somewhat of Portable VirtualBox. The single-window interface is very simple. Basically, you have three main options. One, is to run from live CD image. Another is to boot from a USB drive. The last configuration is to add the MobaLiveCD right-click association for ISO images in the Windows context menu. There's also the Uninstall button to remove the context menu entry. OK, sounds simple. Let's do it. 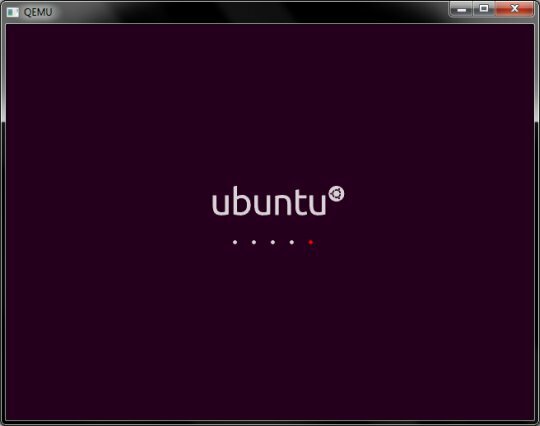 I downloaded the latest Ubuntu image and tried. When you start your virtual machine, so to speak, the software will ask you whether you want to create a hard disk image. This allows you to keep persistent sessions of your testing, akin to what VirtualBox or VMware products normally do. You can try either. And then, boom, the error! 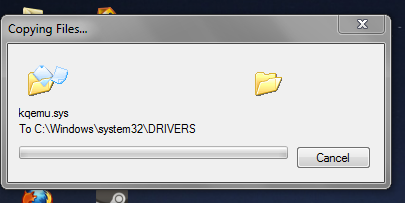 Unlike the original advertisement that the program runs with no installation, MobaLiveCD tried to copy two drivers into the System32 directory. This is contrary to what the program is supposed to do. Furthermore, this means you need to run the software with elevated privileges. Not quite as portable as it says. After relaunching the program with Administrator privileges, I got the ISO to boot. However, it was horrendously slow and never quite reached the desktop. I retried with Puppy Linux, just in case. I got the same results. In both cases, I never got to use the system. So there were two cardinal issues with MobaLiveCD: the drivers installation and the fact that it did really work. Then, I also noticed the copyright on the website read 2008. This could be an innocent webmaster's innocent omission, but it could also mean this software has not seen active development or bugfixes in the last three years. Not really encouraging. There's also the spelling error in the right-click menu entry. It is spelled correctly on the button, but misspelled in the description text. Not really professional, I'm afraid. At the end of the day, I have to say, MobaLiveCD did not work for me. Sadly, MobaLiveCD seems like a dead product. I can't imagine why distribution developers would recommend it, given its buggy nature. It is quite possible that I have stumbled upon rare and weird issues that no one else has seen. But the combined effect of drivers installation into a system folder and the failed execution of images make it rather pointless. You are better off with VirtualBox or VMware Player or Server, which are free for personal use, even if they require more resources and a far more elaborate initial setup. You may also try running QEMU natively, without the wrapper software created by Mobatek, to see whether this works for you. Well, I guess that would be all.